The ancient Norse Vikings had what was commonly known as a pagan religion. This means that they had a religion that was not one of the primary religions like Christianity, and they did not acknowledge those religions or their belief systems. It was common for what are considered pagan religions to believe in many gods rather than one. The Vikings had their own form of religion as such which conformed to this idea and as such was based around their various gods, goddesses, giants and mythical beliefs. What is important to know before we go any further is just how little we truly know about the Viking beliefs, rituals and other activities related to their gods. The greatest form of information we have on the Vikings comes the Codex Regius which translated means ‘kings book’ and other documentation that wasn’t written until the Viking and Scandinavian people had converted to Christianity around two centuries later. Additional information also comes from the Poetic Edda contained in the Codex Regius, which is a collection of Old Norse poems and stories that cover many many Norse mythological stories and practises. From these ancient documents we have links and references to the old Norse beliefs and their pagan acts. The Viking world tree the Yggdrasil. The Vikings belied in a multitude of realms or home worlds in their universe, nine in total, populated by the Gods, humans, the giants and the sinners. 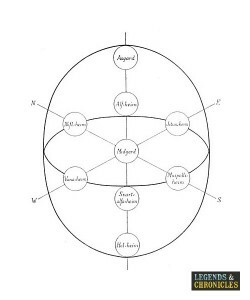 These realms were bonded by the Viking world tree, known as Yggdrasil, which was an ash tree with special powers, its home was rooted in the centre of these Norse realms. 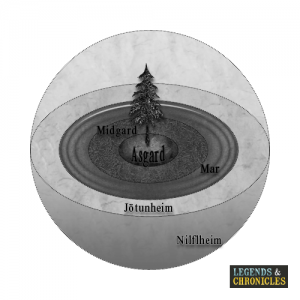 The three primary realms were Niflheim, Midgard and Asgard, which we go into a little bit more detail about below. Nilfheim was the world of the mist, and literally translates as the ‘land of freezing mist’. Dark, cold and clouded in said mist, Nilfheim was unfriendly if we were to describe it in a few words. Niflheim was located in the far north, and on the lowest rung of the Norse universe. It was reserved for cold blooded murderers, people who broke the Viking oaths and ner do wellers. Midgard was the middle realm, the land of mortals in ancient Norse times. This human filled land was linked to the home of the Gods, Asgard by the rainbow bridge. Asgard in ancient Norse mythology and religion was the home of the Aesir gods, led by the mighty Odin. Asgard itself was home to many realms inside its boundaries including Valhalla and more. Asgard was located in the middle of the Viking world, and on the highest rung of the Norse universe. It was populated by the elite gods the Aesir, including such as Odin, his wife Frigg, Thor and many more. Vanaheimr or as it was known in the old Norse times, home of the Vanir, was just that. The Vanir were a Norse group of gods, including Freyja, Freyr, and their father Njord. These gods were known for their association with virility, love, passion and beauty among other things. The gods of the Vanir were also later joined with the Aesir and become members of that primary group. The 9 realms of the Viking mythological world. Alfheim was the land of the elves in Norse mythology, with this particular realm being home to one of two groups of elves. Alfheim was home to the light elves, a race that the Norse reported to be pleasing to the eye, and very beautiful. The other group of elves in Norse mythology were the dark elves, they did not live in Alfheim however, but deep in the realm of Svartalfheim. Svartalfheim was known in old Norse mythology to be the home of the dark elves, often referred to as swart elves. The interesting point of uncertainty with Svartalfheim is that many sources list this realm as the home of the dwarves as well. Whether this means the dark elves were also dwarves or simply of not as grand a stature as the light elves remains unknown. Muspelheim was the realm of fire, the flame to the ice of Niflheim and ruled by the Giant Surtr. Surtr was the leader of the fire giants that inhabited Muspelheim and was famed for his sword that burned bright like no other. In the Norse mythology its told that the two lands of Muspelheim and Niflheim at some point met, and at this point the fire and ice joined, creating water. Helheim also known as Hel was the underworld of Norse mythology and was home to the being who oversaw this realm also called Hel. Hel was the daughter of Loki, and her realm of Helheim was actually situated in Niflheim. Helheim was the place where Vikings would go should they die from natural causes, or more specifically not in battle. Once there, it would be impossible to leave, Helheim was surrounded by the river Gjoll and guarded by a devilish giant hound, known as Garm. The Viking mythology and belief system was detailed and complex in its structure. The depiction of the nine Viking realms and the many gods, giants and humans that lived within them shows a fascinating level of detail.